As all of my readers know, I am a lover of coffee. I’m a coffee enthusiast who can drink the warm bronze liquid (or cold bronze liquid) any hour of the day. I love it. I can’t help myself, I just do. 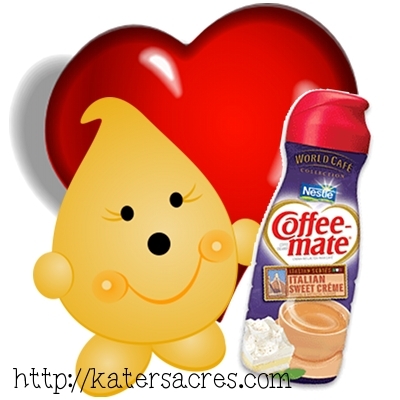 One of the things that I find myself spending a significant amount of money on is Coffee-Mate’s Italian Sweet Creme coffee creamer. Oh…it’s almost too good. But to be honest, the $3.00-$4.00 price tag is a killer on the shopping budget. Especially when hubby and I go through one of these 32 oz. containers a week. So, I decided to make my own. I looked up recipes online and found hundreds, literally hundreds of make your own liquid coffee creamer recipes. This one is by far the easiest of all that I found. But I also learned something else…there are 2 ingredients in this creamer. There are over 13 in the store bought version, 11 of which I can’t pronounce. So not only is this cheaper for your wallet if you shop at discount stores, but it is also better for you as well. Because I have been a devotee of this awesome coffee additive for so long, I have been stock piling these jugs when they are empty to reuse for all kinds of things. I have several filled with flax seed, beans, lentils, barley, etc. But now I make and fill them with my own copycat recipe! Make sure you have a container large enough to hold at least 32 oz. of liquid. NOTE: Whole Milk makes this FAR cheaper than evaporated milk. Put milk & sweet & condensed milk together in a pot on the stove. Place on Med-Low and whisk until milk begins to simmer. Remove from heat and let stand until warm. While this is not a complete dupe for Italian Sweet Creamer, it is by far healthier for you & your body. Yes, it does taste a little different, but it is the closest I have been able to come to this point in time. I want to find a Vegan version of this using almond milk and vegan sweet cream. I tried this recipe using a 1:1 mixture of condensed milk to evaporated milk with a few drops of pure almond extract and pure vanilla extract. It was the closest I could get to Italian Sweet Cream flavor. Wonderful! I’m glad you enjoyed this recipe and found it useful. I made this recipe this morning. I used 1 can sweetened condensed milk, 1 can evaporated milk, 1/2 tsp coconut oil, and 2 drops of vanilla. It’s good but I don’t think I have it close enough. The nice part about this recipe is that you can tailor it just about any way that you’d like! I made this recipe last night with the following changes: I used 2 1/2 cups whole milk, 1/2 cup heavy cream (because I had it on hand!) 1 can sweetened condensed milk, 1/4 tsp salt for depth of flavor, and about 1/8 to 1/4 tsp vanilla. In my eyes, it was a total success! I’ve been addicted to the coffee mate version forever, but this tasted so much better to me. The coffee mate version tends to have a chemical taste as my coffee cools down, but the home made version was absolutely delicious through and through. That sounds so Amazing! I’m Pretty sure that’s liquid ice cream you’re describing lol also how is this article a healthier alternative with sweetened condensed milk containing 120 calories and 22g sugar per fl oz? We really like it and I continue to make it. For us, it’s not so much about the sugar, but more about all the other “bad for you” things in the store bought creamers; the preservatives, additives, etc. I make somethin very similar, I use Vanilla almond milk in place of the whole or evaporated milk, I add 1/4 to 1/2 tsp of any number of extracts.my guy like when I do 1/4 caramel and 1/4 of hazelnut. Almond milk mixes super well I rarely notice any separation either. plus its so creamy !! That sounds super yummy. I had NO idea that Almond Milk was creamy. I may have to try this. i can’t wait to try this! Thanks so much for posting!!!! I love the vanilla caramel coffee mate. I’ll see what I can come up with. Just realized how bad coffee mate really is for the body, and I’m hooked on it. I’m trying to improve what I consume 🙂 thanks again! I am so very hooked on this “Italian Sweet Cream” creamer that I felt I needed to find a healthier, cheaper and less calorie replacement. I gave this more than one try but, there is just no replacing that rich, incredibly sweet Italian Sweet Cream by CoffeeMate. There is a hint in the picture on the bottle. I know exactly what’s missing though, so as soon as I make a trip to the grocery, I will make a few adjustments and give it another go. I use the Italian Sweet Cream when making my Cappucino’s with Hazelnut Espresso coffee. It froths so well and the richness is incredible. I now have Hubby hooked on those as well, so we must find a healthier, less expensive solution. Did you try this again and come up with a good version? Looking to make this myself. How about using the same ingredients PLUS 1 tea. vanilla AND 1 tablespoon (Organic) Coconut oil while heating! Haven’t tried it yet, but sounds good! will give you the flavor of the Italian Sweet Cream. 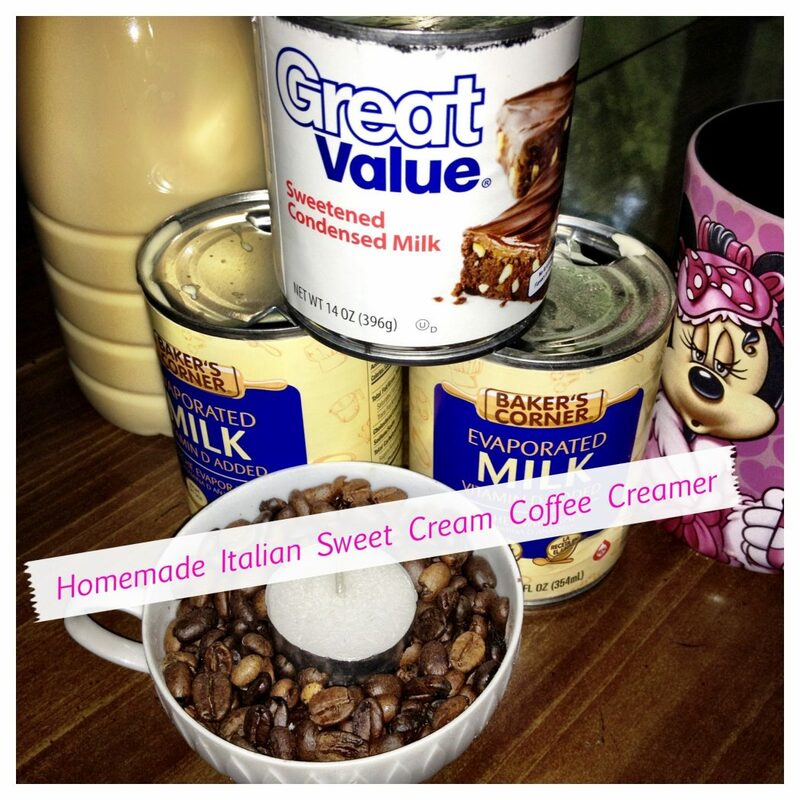 I was very excited when I came across this recipe as I LOVE the Sweet Italian creamer. I took into account the money you say that you saved and the uncanny taste comparison. To say the least….Not impressed and extremely disappointed. First, the 3 cans it takes to make the recipe are in fact more expensive than the actual product itself. Next, the final product tastes nothing like the Italian Sweet creamer. I’m sorry you didn’t like it. Please know that I shop at Aldi’s and pay very little for Sweetened Condensed Milk. Also, the recipe clearly states that by using whole milk you will accumulate far more savings than using canned milk. The point was not just to save money but to get rid of all the processed chemicals and junk that the Italian Sweet Creamer has. There are two ingredients in this mix: Milk & Sugar, both natural and better for you than the laundry list of ingredients present in the CoffeeMate version. Have you considered making your own condensed milk and using raw milk, if buying a herd share is available in your area of the country. I am doing that these days and love all the coffee creamer recipes available. You’re only limited by your imagination! Thanks for sharing! Saw this recipe and another that said 14oz each of milk and sweetend condinced milk. Figured I’ld split the difference and use two cups milk. Since freash goats milk is what I had on hand that’s what I used.I think it is better than Coffeemate. Thanks for the idea. Thank you. I am making this! I’m glad I found a recipe for this creamer. I’m just curious why does it have to be heated? Can you get the same results without heating it??? Heating it allows the Sweet & Condensed Cream NOT to separate from the milk when you refrigerate it. Otherwise it will separate. I still shake it however before I use it. The Italian Sweet Cream is my favorite, but I don’t like all of the chemicals and additives. Can’t wait to try this at home. I can’t believe those 2 things are all I need to make it myself! Wife bailed on the original italian sweet cream because of the oils and we went to the Natural Bliss version which is also much less sweet (a plus to me). We recently noticed the shelves were empty at all the stores and found Nestlé had initiated a voluntary removal of the natural bliss original and vanilla due to Quality issues ( I’m sure). So I found you by searching for homemade versions. I find it a bit ironic that we all wanted to find a homemade recipe for “sweet cream”….anyway thanks for the idea, we will give it a shot today. Additionally I was looking for a homemade version of the Gnu-Bar which I find to totally rock if you want a natural fiber snack bar. Thank you for providing a trans-fat-free alternative! I hope you and your family continue to seek trans-fat-free alternatives for whipped cream, chips, baked goods and other products that frequently contain partially hydrogenated oils. Making this today. Hubby loves the original-but I don’t like all the chemicals. Also going to add Hazelnut to some for me. Will keep you posted. Thanks so much! I did not like the homemade Italian sweet creme coffee creamer, to me it did not come close. I’m sorry it didn’t suit your tastes … we love it in our house. What would you do differently? Does this work as well with reduced fat milk and reduced fat evaporated milk? My husband is a heart-healthy diet and would love this as an alternative to the “real” creamer. Thanks for posting!! Hi Barbara, I wish I could answer this for you, but I’ve never tried it. If you do, please let me know if it worked for you! Hi Katie, just found you by searching for this recipe. I once did something similar out of necessity. I was housebound and no creamer or half n half in the house for coffee or tea. Well the pantry had sweetened condensed milk and dried milk powder left over from Christmas baking. I made double strength milk from the powder and added the can of sweetened condensed. I didn’t cook it and it was okay, but not close enough to the coffee mate sweet Italian cream, my favorite for coffee. So, I want to thank you so much for this recipe, I made it today using the evaporated milk instead of fresh milk and it was great, really close to the original. I find the cost to be comparable, but the health benefits are well worth it, plus it’s a pantry staple. Thanks again! WOW—Just found this on Pinterest yesterday and am making it right now to try tomorrow morning. I also am using evaporated milk instead of whole….do you notice a difference in taste with using one verses the other? So excited to look around your blog and see what other wonderful ideas you have. Sounds delicious, easy and better for you than store bought. Thanks for sharing! Thanks for stopping Angel – I appreciate it. If you drink coffee, you should try this. Love creamer but I no longer use it because of the calories. I still use some Agave sweetener but just a dab. Recipe would have been wonderful to have for the years I used creamer. Thanks for stopping Marianne – how are you feeling? Are you doing better? My thoughts too Leah….how hard is it to pronounce “Milk” and “Sugar” as key ingredients?! It’s SO GOOD Mona. I know you are a coffee drinker too. You should try this.